Do you remember a few months ago receiving a stack of papers in the mail from your insurance company? If you’re like many, you probably stuffed them in a file cabinet never to be seen again. Pull those papers out for a minute. Brush off the dust. One of the first pages in that assortment of paperwork is called a Declarations Page. The Dec Page highlights some of the main coverages in your homeowners policy. One of the items cited on the Dec Page is your deductible. A deductible is an amount you would pay towards a loss before your insurance company would pay for a claim. It’s your share of the risk. You’re responsible for that amount first. Beyond that, the insurance company will take care of. Your Deductible will apply to the structure of your home, outbuildings, and your personal belongings. Your Deductible will typically be a specific dollar amount or percentage. A Deductible for your auto and home is different from a health insurance Deductible. Health insurance Deductibles are annual. Once you meet it, you’re done. Auto and home deductibles are per claim. Every claim you have, you’re responsible for the deductible. How Do I Know What My Deductible Is? Look at the Declarations Page of your homeowners insurance policy. This will be one of the first pages in the stack of papers the insurance company mails you. Let’s say you experience a hail storm. You call a few roofing contractors to determine if you need a roof and what it might cost to replace your roof. You learn it will cost $8,000 to replace your roof. Your Deductible is $1,000. You will be responsible for the first $1,000. Your insurance company will pay the remaining $7,000. You insure your home for $300,000. Your Deductible is 1%. Your roof will cost $8,000 to replace. You would be responsible for $3,000. By raising your deductible it will lower your premium. But remember, you’re responsible for the deductible. Make sure it’s a number you’re comfortable with. 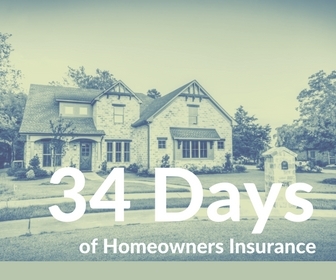 See all 34 Days of Homeowners Insurance here.